I leave this academy after 4 months of training. When I look back to my time here, there has been so much that happened. The physical part is probably the biggest thing that has changed. The improvements in flexibility, strength and condition are amazing. When I arrived at the academy I had barely any experience in a fighting sport, but the first thing that surprised me was that the biggest part of all the students here, have barely or none experience. I really enjoyed my training with Master, a Master who is focused on Sanda (Chinese kick-boxing). After a while you are able to join a sparring fight. In these fight the different Shaolin classes fight each other. It is a good test for yourself to practice your skills. It is also good to know that the master makes personal training schedule for the students, so the training you get is really based on your own conditions and abilities. The trainings have enough differences to keep it enjoyable. There are the usual forms and Sanda trainings. But also, power stretching, power training, Qi-gong, martial art theory and the mountain run every week. We even went one time with every one on the academy to climb the highest mountain in this area, a climb to almost 1000 meter. That was a really great training. The facilities that the academy offers are good. There is an Internet room, where you also can buy drinks, food and small accessories. My roommate and I even took an Internet connection on the room, because we have our own laptop here. It is not common to have your own room. So you have to share it with another student. You need to have a little luck to have a roommate where you have a good connection with, but the academy is really easy with switching rooms. After 3 weeks here my roommate left, and another we decided to travel together to Tibet. Because there are so many students it is easy to make friends, and after a while it became your family. 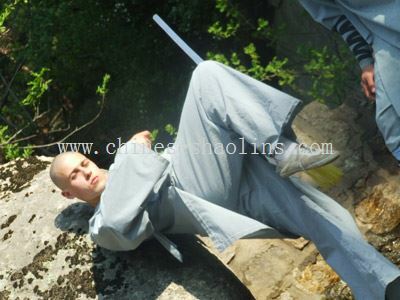 My choice to go to a martial arts academy in china was for the real experience of Shaolin training. Closer to that feeling you will not get. The trainings are hard, tough, and to the maximum of your possibilities. I will take this experience with me for the rest of my life, because it is not only the training. But the whole atmosphere, way of life and the theory what is behind everything we do. I go home with 3 grading (tests) and 1 sparring fight. I spent four months at the academy training from September till the end of December. I can honestly say it has been the most different, difficult and best experience I have ever had. Pushing yourself to your physical limits almost on a daily basis was a completely alien idea to me at first. Like many others I entered the academy with no real experience in martial arts and I had no idea what to expect. After a little time I realized that “Kun Yu Mountain Shaolin Martial arts academy” are less of a school and more of a way of life. Whether it is pushing yourself to get out of bed for Qi gong at 6 am in the morning, accepting the pain of power stretching for the definite benefits, putting in extra training where you realize short-comings or even braving sparring just to see what happens against certain opponents, all of it contributes to a great training experience which is really a great test of your nerves and determination. I felt free to push myself further than I ever thought possible and with the help of my master and other students and I leave with the rewards which I hope to build on long after today. In my first few weeks here one of the older students told me that any day one does not end in pain was probably a waste of a day and I now fully agree with him, you need to work hard to get better and over time you will. In many ways the people here are what makes the experience good or bad and I was lucky enough to meet some very good friends here who helped create an atmosphere in training where we stretched ourselves to our limits and outside where it was fun just to hang out. Some days at the academy are not easy such as where you may have an injury or you have a bad training day so friends help and hopefully inspire. The masters also take very good care of their students, if there is a problem they are always there and willing to help in any way they can. In terms of training my master, Master Du, always identified what the class wanted to do or was lacking in (usually the same thing) and had us all practice that and he put in extra times on students outside of class many times if they needed it. The physical sides of the martial arts are great, but so are the theories behind Shaolin martial arts and the different outlooks on life such as those presented by Taoism. The masters held martial arts theory classes to explain some of what we practiced and there is a lot to learn from advanced students and Chinese literature if you can get a hold of some. At the end of the day I think that in the academy you learn a lot about martial arts for sure, but even more about yourself and the different ways of living. 1 year January 2nd, 2007-December 21, 2007. In the first week of January ‘07 I arrived at the academy without experience in martial arts. This evening I am leaving this place I call home, Kunyu Mountain Martial Arts Academy and going back to Oslo, Norway. After my first day of training here I fell asleep 3 times while trying to write one page in my diary. On my third day I wrote that I don’t recall ever being in so much pain. And so I realize my body must have changed since then. I am no longer sore after workouts; I’m rarely tired or fatigued. The training we do here will improve general fitness and especially the body’s ability to recover quickly. There are so many aspects in which one improves when training to be a martial artist. It is a lot more than just strength and endurance. Conditioning the body to withstand strikes without bruising or breaking, building the reflexes to react to an attack, and the speed to counter. Learning to see openings in your opponent’s defenses and understanding how to exploit them. Among the students I have trained with I have made many good friends from different parts of the world. Some of the students also have incredible knowledge about training, nutrition and health. The masters here are some of the best in the country and they really work hard to teach the things we want to learn. Everything is in place to create the best training environment; the only thing you need to bring is motivation. In my time here I practiced tai chi before breakfast, shaolin forms in the morning and sanda in the afternoon. In addition I did one short workout every lunch and 3 running sessions every week. On the weekends I often went out for a cheap meal in the market and picked up some fruits and nuts for the coming week. Strangely the weekdays seem to disappear in rapid succession, and new weekends seem to appear more often than in the west. I have learned Yang style tai chi 24 step, 42 step, dao (broadsword), and only just started learning Chen-style 22 step. In shaolin I learned about 9 forms including a southern fist and a double broadsword form. I also learned 2 two person forms (fixed sparring) and 2 group forms. Sanda skills are difficult to measure; I can say I’ve learned enough to feel comfortable in sparring with other students. I’ve also been introduced to the basics of Bagua and Baji. I feel this has been the most important year of my life and it has been a pleasure. 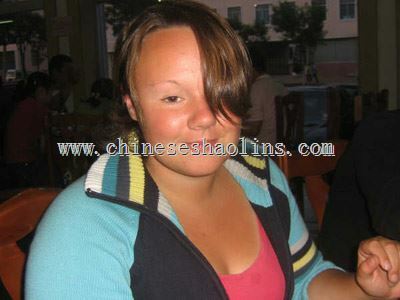 If you are considering going to China, stop considering and start planning. The time I have spent at Kunyu Mountain Shaolin Martial Arts Academy has been very special to me both in terms of the experience of living in China but also what I have learned. I have made a lot of close friends while being here. The people in general studying at the academy were friendly and helpful to me. The masters although very strict (which I thought was good) were also very friendly and eager to help you with anything you were having trouble with. I would definitely recommend the academy to both beginners as well as more advanced people who study martial arts, although I would stress that what is taught at the academy is very traditional martial arts, taught in a very traditional way which can take a while to get used to. Then what else would you except in China if you have come here to study? The training is very tough but good and definitely has become fitter, stronger, more flexible and focused. It has also helped with some aspects of other martial arts I study I must stress it is not a holiday camp! The facilities are adequate to train in but the food does take some getting used to. (It’s Chinese food). The washing and toilet facilities aren’t to the standard of back home in Britain but after all, it was In China and I got used to them fairly quickly. Overall I enjoyed my time here and I hope to come back train in the future but also to take back what I have learned and experienced with me, which I will never forget. This is my second time living and training at Kunyu Mountain Shaolin Martial Arts Academy and once again it has been a positive and rewarding experience. All the masters here are very helpful and are keen to help students improve their kung fu no matter what their level. My thanks unparticular go to master Guo who was very patient and kind when teaching me Baji and Wing Chun. He is an excellent teacher and I hope to study with him again in the future. Other than that the standard of the school is excellent and I look forward to returning to continue my training. After staying at Kunyu Mountain Shaolin Martial Arts Academy for 9 months I feel both excited and sad to be going home. Sad because I have made so many good friends with the pupils, masters and staff and because I will miss the tranquil and beautiful place that has become like a home to me. However I feel excited to be torturing with new skills that I have learnt here, when I arrived my fitness was generally pretty good but my flexibility was horrible. As well as becoming much more flexible. Training here improves your strength agility and coronation as well. This is taught through a combination daily exercise in forms, sanda(Chinese kick-boxing),and general flexibility and strength training. The training students receive from masters is top class. If there are any questions or problems students are encouraged to go straight to their master, which provides a good atmosphere in the school. Also if students wish to learn any form or skill master will point them in that particular direction. The conditions are pretty basic but the school is improving as it grows. My advice to any new students is to work on stamina and flexibility before coming to the academy. This will ease the transition into daily training. Also paying extra attention to basic skill while here is important. I must covey a huge amount of respect and thanks to my master, Du Shifu. His patience and kind help made it possible to achieve what I wanted here; I hope to train with you again some day. My thanks also to and Shifu for helping me Taichi, a practice I will treasure. Finally thank you to all the staff at the academy especially the translator. If you are considering attending the academy, good luck before that! First of all I would like to say a massive thank you! I was very nervous about coming to the academy as it was my first trip away from home alone, but as soon as I stepped through the gates a whole class full of students, which made me feel so much better, greeted me. I had a hard first few weeks getting used to the heat, the food and the training which was very hard but the masters and the students all helped me through and now I love this place and don’t want to leave! I trained for just over four weeks under your supervision and I am still shocked to about just how much I have learned. It was truly a privilege to be tutored by such a skilled Shaolin master and I have respected and appreciated everything you have ever taught me. I hope I will return home with the same dedication to my training as I have gained here and who knows one day return to further my training! I hope it brings you some happiness to know that you personally have made my experience here in China a great one! Thank you so much again for all that you have done for me, I won’t forget it! Although my time at the Academy was short, I’ve never had a more memorable month. Whilst training found I had muscles I didn’t even realize existed. Then after training those newly found muscles really made themselves known as they proceeded to ache for days afterwards. I came to the Academy on a whim, but as I come to going home I find it so hard to leave. Not only because of advancements in training (finishing my staff form, completing my Mantis form, learning to kick up, etc) but also because of the people and way of life at the Academy. Everyone is so welcoming and helpful. The masters are both patient with you and also push you to give your best. Least of all to say I wish I could stay longer. I have greatly enjoyed my time here at the Academy and even through I have been here for only one month. I feel that I have learnt a lot. When I read on Real Gap that I was to be taught by Shaolin masters, I never thought I would be taught by some of the best masters in the world. I feel truly honoured and grateful to be taught by such masters and respect them greatly. The accommodation here is a lot better than I expected and was realized to find they had hot showers. I was not too keen on food here but I would not ask them to change it as it is to their religious taste and l respect that. The masters, translators and staff were all welcoming and friendly throughout my stay and I will miss them. The training though sometimes tough and sore! Was always enjoyable and I learnt a lot. Thank you for this opportunity to train with such respected masters in a comfortable environment. As a total novice with no prior experience, I found the Biji class a fantastic introduction to martial arts. I signed up for a month of training. From the start it was evident that hard work and patience is required to see the benefits of any martial art. I was shown the basic principles of Baji, taught methods in body conditioning, shown various Baji applications regarding grips, holds and throws for self defense. My class was also instructed in performing a traditional Baji form, which includes many methods, and principles relating to the Baji martial art, highlights of the month was training in the mountains and learning the Baji form under master Chen’s instruction. Master Chen is a great example of a man who has dedicated his life to perfecting a martial art. He is a man of great character and also the person whom I respect the most at the academy. He has proven this as a martial of Baji and as a teacher. I will miss my daily training with him. Before I come to the academy I knew the facilities were basic so it was no shock to the system when I arrived. Unfortunately due to the lack rain there was a water shortage for the majority of my stay. But that ended within 12 days. The training surpassed my expectations I loved every minute of it even the power stretching! I was in Master Wei’s Shaolin class. He is a fantastic teacher, every day he works you very hard but he makes the lesson fun and always gets the best out of you. All the students really admire him and if I ever forget the opportunity to come back I would relish the chance to train with him again! As a 19-year-old girl, the decision to come to China to study kung fu was probably the biggest and most important one I have made in my short life and it has been a most rewarding experience. Surrounded by the beautiful Kunyu Mountains and the pleasant orchards of the local villages, the academy offered me a chance to escape from the lazy western world and enjoy the simpler, more natural side of life. Exercise, fresh air and a good academy atmosphere contribute to an all-around healthy way of life. From day one, I knew I had come to the right place and that I was going to enjoy my time here. As a practitioner of martial arts before I came here, I knew the difficulties involved in learning. However, I was completely unprepared for the demand kung fu would have on my body. At the academy, the daily schedule enables you to get the most out of the day. The early mornings and dare I say it, this early nights are a schedule I have adapted. The training, of course, is pretty intense as long as you show willingness to learn and train you will be pushed even further. The basics and forms classes were something I enjoyed immensely. Kicks, sweeps, fist forms, weapons… I found they were truly what I had come here to learn. The more acrobatic side of things was not easy for me to pick up. I spent more time landing my bum than my feet. However, the gradual improvements I noticed each week helped lift my spirit and keep me going. Sanda, while it was not truly what a came to China for, became something I enjoyed immensely. The physical workout and the punching of heels became great for stress relief as well as a practical fighting skill. At the academy, I found the challenges of kung fu mental as well as physical, exercising muscle and willpower, pushing my body as far as mind would allow it. The aches and pains of the first week are gradually replaced by feelings of greater flexibility and strength and an all-around better feeling in one’s self. Of course, one of the things, which completed my stay here, was the people. People come here from all over the world and it serves to make the place even more interesting. I can now claim to have friends from England, Indonesia, Africa, Iceland, America… We all come here with a common goal in mind－to study kung fu. It may sound cliché but the academy is like one big family. It didn’t take long before I was calling it home. Last but not least, I must mention the masters, whom, in my opinion, are amazing. I have to especially thank my master, Wei Shifu, for his dedication to training us and his patience. His knowledge of kung fu is profound and I am grateful to him for teaching and showing me what he could in my time here. Over all, the nine months I have spent here have been the best of my life and now, that it comes to leaving all I won’t to do is stay. P.S. I’d like to say a special thanks to the cleaning and cooking ladies. You gals are great, always smiling and happy. Overall, I am very happy with how the last five months have gone. Although there are many things about the academy different to what I expected, I did not mind because the actual training and teaching that I had was extremely good and this is the only important thing. 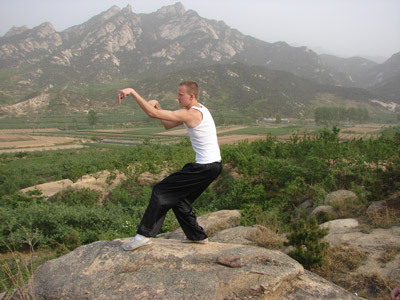 I am very happy that I chose to do praying mantis style with Master Zeng for several reasons. I think that the internal side of it is very interesting and good for a healthy mind and body and I also liked it’s flowing appearance. I also liked that it was a small class because it meant I got more individual attention and had to constantly try hard and I think this is a reason for my improved flexibility and fitness. The main reason however, was my master, Master Zeng who has been very patient and helpful with me and has made a very good training schedule with. And Mike’s performance last grading , I wanted to be able to do that myself and if I return, I will definitely learn Tai Chi. I am also sad to have to go now as I would have liked to stay longer to complete staff form and get better at mantis boxing (sparring) but unfortunately I have to go to university in England now. Thank you very much to all the staff here: Masters, Translators, Kitchen staff, chef. They have all been very helpful and enjoyable to live with. I have had the pleasure to watch as both my body and my will power have grown. After completing my stay of one year I often look back into the days when I was a defenseless and uncoordinated 20 year old. Not being able to simply jog for 15 minutes. I see now that all that has changed. When I arrived here last year I was lucky enough to be placed into Master Wang’s group. I immediately noticed the quality of his teaching and the patience he had for his class. I began learning quickly and soon realized how difficult of a journey it would be. Learning a martial art is not something that happens by only opening your mind. It takes a person that is dedicated who can endure hardship. I have had the chance to learn from a few different masters and have noticed that each has a slightly different approach to teaching. The masters are friendly and patient with their students. It is wise for a student to ask for help when it is needed. The masters have been teaching for many years and it can be intimidating to someone who is new. Here there is meant to be no ego, as a if you are just a beginner or advanced it doesn’t make a difference as to how you will be treated. It only takes good morale quality and dedication to progress quickly. I am happy to have been able to study shaolin, sanda, and Mantis fist. This has opened my eyes to different styles and differences in fighting systems. I am very grateful for the patience and respect I have received from my masters, Master Wang, Master Du and Master Zeng. Thank you for your excellent quality of teaching and kind friendship. I have spent the last 14 months learning shaolin kung fu in the academy, and during this time I have learned a tremendous amount of skills and abilities. I learned 16 forms in total: 1 ba ji form, 1 internal shaolin form, several shaolin fist forms, several weapon forms including staff, sword, spear, short staff and 3 section staff forms. Besides learning those forms, I also learned many jumps, acrobatics and various stretching methods. They include jumping front kick, whirlwind kick, cartwheel, jumping side kick, jumping split kick, front handspring, lotus kick, butterfly, back flip, back handspring, front roll, back roll, various fall down techniques, kick up, and many more. We also learned various punches, kicks, and take down techniques in san da (Chinese kickboxing) class. Besides learning those kung fu skills, staying here also exposed me and taught me how to interact better with people who come from different countries. During my stay here in the academy, I met people from England, U.S. Netherlands, South Africa, Vietnam, France, Ireland, Sweden, Norway, Malaysia, Canada, Germany, Peru, Mexico, Yugoslavia, Denmark, Australia, Iceland, Italy, and many, many more. I can’t remember many of them because I met at least 100 people here. Most of the students are nice, and most of the time we get along very well. Sometimes you will meet student who is very good at other martial art. While I was here there was a guy who has done wing chun for many years and it’s nice because you’ll have a chance to talk about other martial art with other students There was also another guy who was very good at acrobatics and sometimes we practiced acrobatics together on the weekend. I really appreciate the time I spent here in the academy, and I am very grateful to be able to learn shaolin kung fu and other kung fu like Mantis and Baji from the Master here. All of the Shaolin Masters at the academy have spent many years training in Shaolin Temple, and as far as I know, they all have done many performances and competitions while staying in the temple which means that they’re among the best monks in the temple at the time. The other Masters like the Mantis Master, BaJi Masters, and Chi Gong Masters have also practiced their kung fu for many years. It is also nice that now every time we have the test, one of the Master will also perform something for the students.? To end my story, the last 14 months has been very valuable to me. Although sometimes it is very tough to stay here that long (without family and friends, seeing many people who live with you come and go almost every week, live in a small village- far from the cities, and the difficult training we have to endure), I’m glad that I got a chance to learn all those skills I have learnt, be able to do some of those tricks that you see on the kung fu movie,? live a simple life which teach me how nice it is back home, appreciate all the people around you even for such a short time. 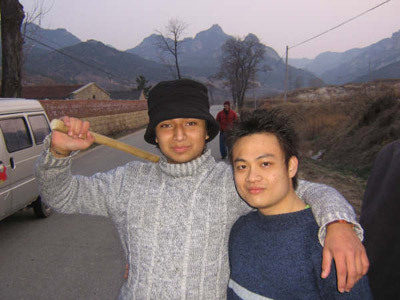 I’m also very grateful to be able to join the kung fu competition 2007 in lian yun gang, xu zou, in China just before I finish my training here. It’s a good opportunity for me to interact with and watch other Chinese kids performing their kung fu skills while also gaining experience in performing my own skills in front of hundreds audiences. I would like to say thank you to all the Masters and all the students at the academy for all the teachings and helps that I received while I was here. There's a proverb in Chinese, " Time flies like an arrow", I can certainly attest to this saying. It feels like just yesterday that I arrived here at Kunyu Mountain Shaolin Martial Arts Academy with my parents, with the intention to pick up kung fu skills that may prove beneficial for me later in life. Now, it has almost been 6 months from the time of my arrival here and I must say that I have gained and lost indeed. Let's start with what I have gained. The most significant benefit that I have gained is the improvement of my martial prowess. I have learnt so much about kung fu in 6 months compared to the progress of most other people who take up martial arts classes once or twice a week. I am the most athletic, the most flexible and the most active physically that I have ever been in my life.? I can kick significantly higher, faster and more powerful. I can even feel the increased strength of my hands every time i clench my fists. I feel that the training in the academy is strenuous although the training hours are merely 4, which is much less compared to the training hours that Shaolin Martial monks have to endure.? I had expressed my desire to learn the drunken fist form and extra training was required to be able to perform the acrobatic moves that comprises the drunken form. Although I never really implement his suggestion, he did recognize the hard work that I have put into my training and gave me due credit, which gave me joy of satisfaction. I have gained social skills that I would have otherwise need a long time to acquire. Now, I'll talk about what I have lost. First and foremost, I have lost perspectives that are no longer helpful to me and I went from delusional to firmly grounded. I have lost those perspectives and form new, better ones in their place. I have come to terms with reality and the limitations of my body and I have learnt great lessons about the importance of physical activities to my health. I have lost weight,4kg to be exact. Well, that for me is a pretty impressive achievement because I had never lost more than 2kg before. I have lost a lot of the fat that's been taking residence on top of my abs and I can see my upper abs pretty clearly when I flex them. To end this testimonial on a good note, I will reveal the biggest achievement that I have attained during my stay here. Are you ready? I AM OFFICIALLY A SHAOLIN DRUNKEN FIST FORM PRACTITIONER! For me, that was one of the main reasons that motivated me to come here in the first place. I must say that I am exhilirated and in pain at the same time. I am happy because my goal is achieved and I can move on in life and I am hurting because of the injuries I sustained from practicing the drunken form. Coming to Kunyu Mountain Shaolin Martial Arts Academy has indeed been a life altering experience that I will never forget. I have enjoyed my time at the academy immersely, and feel that I have learnt a lot in the time I’ve been here, both about martial arts and myself. The atmosphere in the school is terrific; everyone gets on very well and the more experienced students are always helping the newer students with their learning. All of this together leads the group a real sense of family, which is very important when you are so far away from home. It has been very interesting to meet people from so many different countries, something that might not have experienced if I hadn’t come here. In the time I’ve been at the academy, I’ve been taught by all of the masters for at least a short period of time, and all are excellent; the high level of skill they have in their various disciplines commands instant respect from the students. The gradings are an excellent incentive for ensuring that forms are learnt to a high standard. The atmosphere at the gradings is fantastic, with everyone supporting each of the students being tested. It also provides a good opportunity to see what the other students are learning and to see forms performed by the masters. Concerning the staff at the academy, all of them seem to do an excellent job; the kitchen staff are always cheerful and try to cater for our needs, such as providing extra dishes and more bread. The translators do a fantastic job and are always willing to make phone calls on our behalf or are at hand when we want to talk to the masters. In conclusion, my overall experience at the academy has been a very positive one and has been something I will remember for the rest of my life. Our time at the Kun Yu Mountain Martial Arts Academy has been very memorable. The training is excellent. Master Wei is very knowledgeable and helpful, He takes a personal interest in the training and progress of his students, and all masters get along with students very well here. My wife and I decided that we would go on an adventure as soon as we got married. So, we moved to China and lived at this school for nine months. Within the first three months, I had lost fifteen kilograms and she had lost ten. Now, we are in the best shape of our lives. 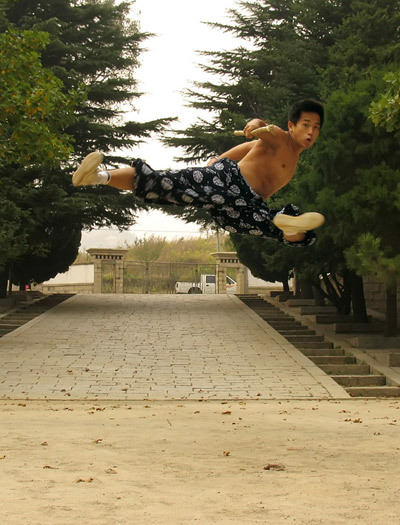 We have learned several Shaolin fist and weapon forms as well as Sanda kick boxing and acrobatic jumps/break-falls, We have also gained strength, flexibility, and endurance. It was challenging to leave a life full of modern conveniences and live a very modest lifestyle. However, that has taught us to take a deeper look at the things that are most important to us. We’ve learned that many things that we depended on back home are really unnecessary, We have also had a firsthand look at China; both the ancient culture and the developing society. Since my childhood I was dreaming to come to china to learn martial arts in a peaceful atmosphere and surrounded by monks like we see in the movies doing crazy jumps and breaking iron bars with their heads. Later in my life I started having a more mature conception of the martial arts. Instead of seeing in them just a couple of a crazy performance tricks I started liking them for the body’s knowledge that they can bring you. So I came to China after a long wait to make my dreams come true. Coming from a country where everything is easy and comfortable it was quite a challenge to adapt myself to the Chinese culture. When I first came here I didn’t think I’d be able to do it but now when I look back I think that the living conditions were not that terrible. In the western world we’re just used to a lazy way of life. I remember now a sentence that some guy told me once in the academy:” Your enjoyment here will depend on how much you like martial arts.” Now that my experience I can say that I agree with him. If you stay focus on the training and nothing else becomes your main preoccupation then you’ll be happy here. Now that I’m finished with my experience I want to say that if we all want to be stronger we also have to accept our limitations. There is time for overcoming, there is time for acceptance. I know this text sounds a little bit negative but what I’m trying to say is that the school is not gonna transform you into a Steven Seagal or what ever if you don’t pay effort in it. For me my travel was an achievement. The school gave me what my dreams were expecting: the possibility to perform some kung fu tricks with the daily Shaolin class and body knowledge with Chi-kong meditation.